Our post today is closely adapted from the work by Wm. P. Breed titled Jenny Geddes, or Presbyterianism and Its Great Conflict with Depositism (1869). To read W.P. Breed’s book, click here. Jenny Geddes was a Scotch woman, a native of that land of great minds and heroic champions of Calvinistic orthodoxy. Born perhaps about the close of the sixteenth century, by near the middle of the seventeenth century, she was a resident of Edinburgh. She was no doubt of a human position in life, with her food and clothing earned by the labor of her owns hands. Whether she was married or not, history does not tell us. She was certainly poor, for in the great cathedral church of St. Giles she had no place among the pews and so went to church with her stool in hand, seeking a place to sit in the aisle or in some other unoccupied spot during the service. Jenny was also, most evidently, a person who thought on her own and acted on her own, decisively and forcefully. She was a true blue Presbyterian, familiar with the Scriptures, and one who expected orthodoxy from her preachers and others. It was on the 23d of July in 1637 that Jenny emerged from obscurity to historic celebrity and renown. On that day there was a strange ferment throughout Scotland and a wild excitement in the city of Edinburgh. King Charles had resolved to make Presbyterianism give place to Prelacy throughout the realm. A book of canons [in effect, a Book of Church Order] had been prepared subversive of the whole system of Presbyterian government, and had been enjoined upon the realm by proclamation upon the king’s simple prerogative. Following this book came a liturgy as a law of public worship, and a royal edict had commanded its introduction into all the churches of the realm on this memorable Sabbath day. Notice to this effect had been given the Sabbath before, and hence this intense excitement. For the Scottish people knew that if this measure were carried into effect by the authorities, Presbyterianism was virtually in its grave. As the hour of Sabbath service approached, the streets of Edinburgh were thronged with crowds of people, full of excitement. There among the crowds, Jenny Geddes made her way to a convenient place, close to the pulpit of the church and there she sat upon her stool. The cathedral was filled to capacity with titled nobility and with the nobler untitled nobility of the Scottish Presbyterian masses. There were present archbishops, bishops, the lords of the session, the magistrates of the city, members of the council, “chief captains and principle men,” and Jenny Geddes and her stool. And as the assembled people waited with tension mounting, the Dean of Edinburgh made his appearance, clad in immaculate surplice, book in hand—that fatal book of the liturgy—the device of English Prelacy for the reform of Scotch Presbytery. The was opened and the service begun. The cup was now full, though as yet no one pretended to know, no one dreamed, what form of expression the pent-up indignation of the outraged people would assume. The question was soon decided. and in another instant her stool was seen on its way, travelling through the air straight toward the head of the surpliced prayer-reader. The astounded Dean, not anticipating such an argument, dodged it, but the consequences he could not dodge. He had laid his book, as he thought, upon a cushion—the cushion proved a hornet’s nest. In an instant the assembly was in the wildest uproar. Hands were clapped; hisses and loud vociferations filled the house, and missiles, such as the hand could reach, filled the air. A sudden rush was made toward the pulpit by the people in one direction, and from the pulpit by the Dean in the opposite direction. Now, he would be marvellously astray who should suppose that this sudden hurricane at St. Giles was but a passing and unmeaning summer squall. It was in truth the outburst of a national feeling. A mighty ferment at this time pervaded the national mind. Great principles were at stake, and the Scottish masses, well comprehending their nature and the drift of events, were solemnly resolved to vindicate their settled religious convictions in the great controversy at whatever hazard and cost. When that irregular band of patriots, dressed in Indian attire, marched through the streets of Boston and tossed those tea-chests into the bay, they at the same time virtually tossed British sovereignty overboard; and Jenny Geddes’ party at St. Giles signed the death-warrant of civil and ecclesiastical tyranny in both Scotland and England! The storm had been gathering for nearly forty years, and this bursting of the cloud marked a crisis in a great national revolution. It was the first formidable outbreak against the tyranny of the Stuarts, and Jenny Geddes’ stool was the first shell sent screaming through the air at those merciless oppressors of the two realms, and the echoes of that shell are reverberating to-day among the hills. 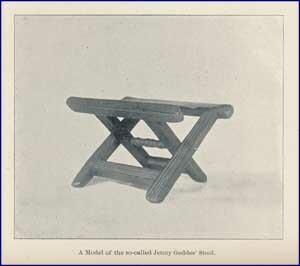 The stool pictured at left is intended to represent the so-called “Jenny Geddes Stool,” and was made from a photograph of a model of the same that is on exhibition in the National Scottish Museum in Edinburgh. The model was made under the direction of the Rev. Robert Buchanan for the President of the Historical Society, and was forwarded through his kindness to [Philadelphia]. 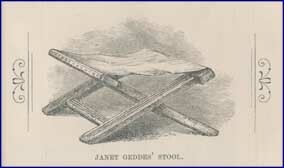 The history of the stool is well known, and needs but brief mention. Charles I. of England, urged by Archibishop Laud, attempted to impose upon the Presbyterian Church of Scotland a liturgical service similar to that of the Anglican Communion. A service book was prepared, which was popularly known as “Laud’s Prayer Book,” (a copy of which may be seen in the Museum of the Historical Society). By order of the king it was appointed to be used in all the churches. On the day when it was first used in St. Giles Cathedral in Edinburgh, a large congregation assembled under a high degree of excitement. Seated near the pulpit was a Scottish matron named Jenny Geddes, who, unable to suppress her indignation, rose from the little stool upon which, as was the custom, she was seated, and hurled it at the head of Dean Hannay, the officiating clergyman, with the exclamation, “Villain! would ye say mass at my lug?” [i.e., ear] This act led to a riotous demonstration before which the ministers fled. This was the beginning of the revolution of 1637 which restored Presbyterianism to Scotland, and of the English revolution, which led to the summons of the Westminster Assembly, the establishment of the Commonwealth under Oliver Cromwell, and finally to the death of Charles I. It is not pretended that the stool exhibited in the Scottish Museum is the precise one which Jenny Geddes threw at Dean Hannay, but simply that it is one of those typically in use in the cathedral at that time. The model in the Historical Society’s Museum, therefore, accurately represents an implement of domestic use that, humble as it is, had a most important part in one of the greatest movements, both civil and ecclesiastical, of modern times.